Set up all the activities around the hall, with a leader to supervise one-two activities each as needed. Allow girls to explore in their own time over the session. The Stone Age is the longest period of Human History. The Stone Age came to an end when people began to work stone. The first people did not lead settled life like we do now – instead they were nomads, moving around following food. Being hunter-gatherers they did not farm crops or animals – rather hunted animls and gathered plants, berries, roots etc. 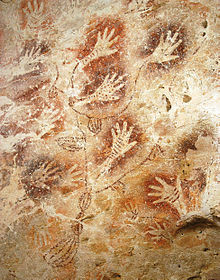 Hand stencils are a common form of cave art – they may have been a way to sign their work. Add your hand to our cave wall by placing your hand on the sheet and spraying around it with the spray bottle. The origins of theatre stretch right back to Ancient Greece. Some of the famous writers include Aeschylus, Sophocles and Euripides whose plays are still performed right up to today. Theatre was performed in large outdoor theatres – or ampitheatres – and the all-male cast wore masks to represent different emotions or characters. The Romans loved to decorate their homes and public places with works of art. The Romans liked to have mosaics in their homes. Wealthy people often had elaborate mosaics in their courtyards and dining rooms as these were rooms that visitors would use. Mosaics were pictures made using tesserae – pieces of stone, pottery, or glass – which are pressed into soft cement. They often showed hunting scense, the harvest or Roman Gods. AS a patrol design and make a mosaic. In Imperial China painting was believed to be the finest of all the arts. However, wood and paper arts were also popular. In China paper cut-outs are traditionally used to bring good luck and good fortune. Make a paper cut out – fold a piece of paper in half and draw a chinese style drawing and make sure all the shapes meet up at the fold. Keeping the paper folded cut out the shapes. In Ancient Japan paper was a very important craft. It was used to make many fine objects – from wall screens to lanterns, sunshades and even clothes. The choice of the best paper for writing a poem or painting a picture was part of an artist’s task.